Consisted only of two parts, a perforated container and a special slatted cover, this watering device allows to give the water exactly where it necessary, directly to the roots of vegetables in the kitchen garden, flowers, trees and shrubs in your landscaping. Why to water all the surface and so waste some water and your time, while roots are under the ground and it's where it need? Here is the logic of conception behind Logissol-O. With less equipment, less water, fewer time and a minimum of risk of diseases and weeds, you will obtain a maximum of efficiency! 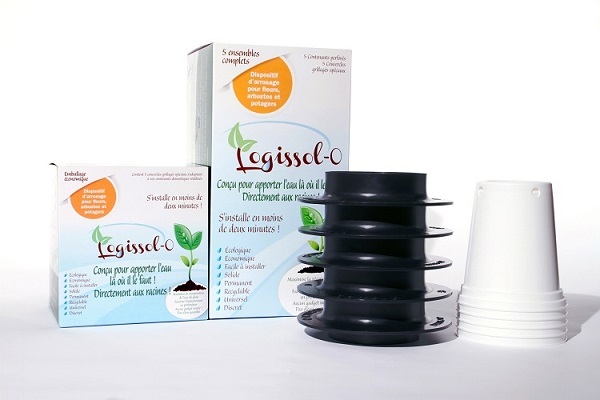 After tests over a period of about ten years, the current design of Logissol-O is the best to answer at the needs for plants and in the practical and easy to use side for the whole interested population.